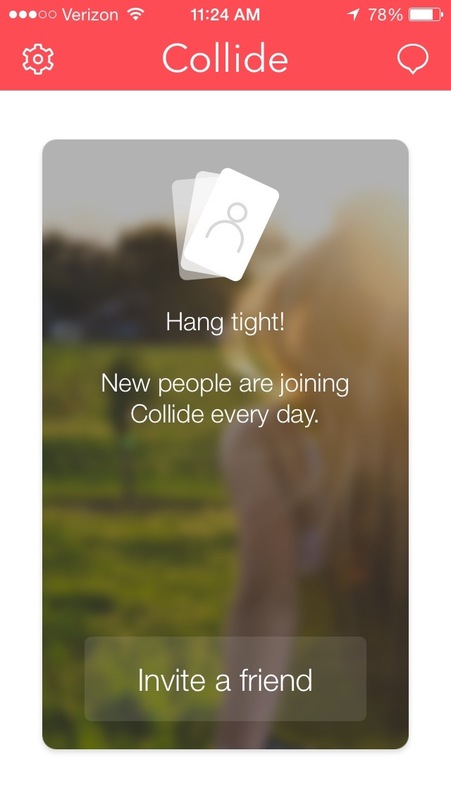 Would you recommend Collide to a friend? From their website "Over the last 3 months, we started working on this idea. We've been through brainstorming sessions, dinner meetings, countless designs, icons, iterations and endless amounts of code. " So basically they iterated for 3 months and ended up copying Tinder? @raulriera basically, but they scrubbed out all of the homosexuality, sacrilege and lustful fornication. jokes aside, fascinating to think what niche dating communities will have tinder-esque platforms. currently looking for "tinder for people who read a lot". for a friend, of course. @eriktorenberg I'd say go to a bookstore, but,… I dunno*. Maybe someone needs to make Tinder on Kindle. *If there are any in SF anymore. @eriktorenberg Good point... Spark Networks did this on the web, so it'll be interesting to see how it plays out in mobile. Ha, good to see more startups exploring the Christian market. How long until Tinder starts including some basic high level filters? Tinder seems to have such a critical mass now that it takes days to swipe through all the individuals in a big city based on the current age and location filters. Add on religion and this product loses it's edge. @ryanmarr I think you may have just answered your own question: when they feel enough pressure from startup competitors. @ryanmarr Disagreed - while building a filter is easy, building a brand is exponentially harder to do. There are a ton of case studies on the app store for dating apps that reflect this today.